For The Love of Your Heart, Exercise! Posted on January 24, 2019 | Comments Off on For The Love of Your Heart, Exercise! If you haven’t yet made wellness resolutions for the new year, today may be the perfect day to begin. Those who resolve to exercise more and eat healthier in order to lose weight may not fully appreciate the cardiovascular benefits of physical activity. Yes, exercise does burn calories, which along with a healthy diet and portion control can help one reach and maintain a healthy weight. A regular exercise routine also modifies or controls many of the risk factors linked to less than optimal cardiovascular health. Similar to the increased risk of developing heart disease due to smoking and high cholesterol and blood pressure, a sedentary lifestyle lacking sufficient physical activity can double the heart disease fatality risk. As well, studies have shown that those who exercise regularly are less likely to suffer a sudden heart attack or other life-threatening cardiac event. Consistent exercise strengthens the heart and all the muscles of the body. Regular physical activity increases the efficiency of the heart muscle, allowing for a slower more effective heartbeat. Exercise stresses the body, but continued training allows the body to adapt and become conditioned to the stress. During exercise, cardiac output significantly increases to provide oxygenated blood to the muscles, as well as oxygen and nutrients to the brain and other vital organs. As the cardiovascular system strengthens, blood pressure becomes more stabilized and physical fitness and endurance improve. Exercise also allows for better blood flow in the small blood vessels around the heart that can become clogged with fatty deposits. Regular moderate exercise can both lower unhealthy LDL cholesterol levels and raise healthy HDL levels, resulting in overall improved cholesterol levels. For exercise to be effective, it needs to raise the heartbeat. Experts agree that 30 minutes of moderate intensity aerobic activity most days of the week will improve cardiac and overall health. Cardio fitness measures how well the body performs during moderate to high intensity activity for an extended period of time. Overall fitness refers to the relationship between the cardiovascular, respiratory and skeletal systems, as all must work together efficiently to increase fitness. Those new to exercise can start slowly and do whatever they can manage, as even five minutes of activity is helpful. Improving cardio fitness takes time, commitment and effort. However, consistency builds both energy and endurance, while also improving mood and lowering chronic disease risks. 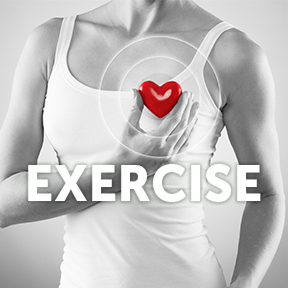 A heart-healthy exercise plan should include both aerobic and anaerobic exercise. Aerobic exercise such as walking, swimming, or cycling strengthens the heart and lungs, improving the ability to use oxygen. Anaerobic exercise such as weight training helps build muscle, strengthens the immune system and increases metabolism, helping to burn more calories while at rest. Walking – Considered a weight bearing aerobic exercise, walking can be done outdoors weather permitting or on a treadmill indoors. In addition to strengthening the heart muscle walking burns calories, aiding weight maintenance. Taking a 15 minute walk after a meal may improve blood sugar levels, reducing the risk of developing type 2 diabetes. Walking improves mood by reducing symptoms of anxiety and depression and helps to clear the mind, allowing for more creative thinking. Taking a moderate paced walk each day can fulfill the recommended daily aerobic activity for people of all ages and fitness levels. Swimming – For those who have access to safe water, swimming provides an all-over workout, without the impact of stress on the joints and body. Swimming keeps the heart rate up and builds endurance, muscle strength and cardiovascular fitness, while alleviating every day stress and improving flexibility. Many find swimming to be a relaxing and peaceful form of exercise. Cycling – Cycling is a low impact form of aerobic exercise that uses all major muscle groups and increases stamina, strength and cardiovascular fitness. A fun way to get fit, as well as a time-efficient mode of transportation, cycling helps to strengthen bones, improves joint mobility, reduces stress and improves posture and coordination. Weight training – Simple weight bearing exercises performed for 20 – 30 minutes twice weekly strengthens the bones, muscles, and connective tissues. Resistance training helps to preserve the quality of life and supports one’s ability to maintain an active and independent lifestyle. Considered a valuable companion to aerobic exercise, weight training increases blood flow to the limbs and results in a longer-lasting drop in blood pressure after exercise. CoQ10 100 mg by Professional Supplement Center®: A naturally present antioxidant, CoQ10 is well known for its heart and vascular health benefits. Found in every bodily cell and crucial to cellular energy production, CoQ10 synthesis declines with age. This highly bioavailable CoQ10, as ubiquinone, is recommended to support cardiovascular, immune, periodontal and liver health. Gluten free, Non-GMO vegetarian formulation. Heart Science™ by Source Naturals: This multi-nutrient Bio-Aligned™ formula is designed to support normal heart function and healthy blood circulation. Ingredients include vitamins, minerals, turmeric rhizome extract, CoQ10 and resveratrol. Cholesterol Support by Wiley’s Finest™ Alaskan Fish Oil: Specifically formulated with synergistic nutrients to promote heart heath, blood vessel function and healthy circulation, Cholesterol Support provides concentrated omega-3 fish oil along with plant sterol esters. Sourced from certified sustainable Alaskan pollock. Free of gluten, wheat, dairy, soy, sugar, shellfish and artificial ingredients. Naturally preserved with Non-GMO mixed tocopherols. CardioVen™ by Premier Research Labs: This nutraceutical formula provides targeted support for cardiovascular health with nutrients such as herbals, fruits, vegetables, turmeric, mixed tocopherols and CoQ10 as ubiquinone. Gluten free, vegan formulation. This entry was posted in Home and tagged CardioVen™ by Premier Research Labs, Cholesterol Support by Wiley’s Finest™ Alaskan Fish Oil, CoQ10 100 mg by Professional Supplement Center, exercise, For The Love of Your Heart, Heart Science™ by Source Naturals. Bookmark the permalink.